This is the trail of Chelyabinsk asteroid which exploded about 14 miles above ground with a force nearly 30 times more powerful than the Hiroshima atomic bomb in 2013. If a space rock hits the atmosphere, and no one is around to hear it, does the tabloid press still report it as an Earth-shattering event? Of course! This pretty much summarizes a large-ish meteor impact over the South Atlantic Ocean, which occurred on Feb. 6, and was recorded by the Fireball and Bolide Reports page of NASA's Near Earth Object Program. The event itself is notable because it is the largest atmospheric impact recorded since the famous Chelyabinsk bolide that exploded over Russia in 2013, causing widespread structural damage and injuries to the city with a population of 1 million. This recent Feb. 6 event unleashed an energy equivalent of 13,000 tons of TNT exploding instantaneously (a.k.a. a "13 kiloton" explosion); the Chelyabinsk impact ripped through the Ural Mountain skies with a whopping energy of 440 kilotons. 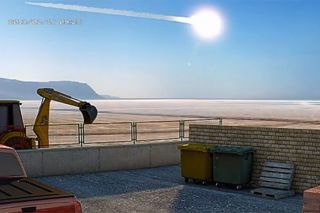 Initially noticed by NASA's Ron Baalke and then investigated by Bad Astronomer Phil Plait, it quickly became clear that the high-altitude impact was likely caused by a chunk of space rock approximately 5-7 meters (16-23 ft) wide. The Chelyabinsk impact was caused by a rock nearly 20 meters (65 ft) wide. The Feb. 6 meteor most likely burned up the majority of its mass during atmospheric entry, any pieces falling as small meteorites safely into the ocean. ANALYSIS: How Many Tiny Asteroids Buzz Earth? This didn't happen over a populated region and, as far as I can tell, there have been no eyewitness reports from mariners or pilots who happened to be in the area at the time. Though this is certainly an important and scientifically interesting event, the impact on the lifeforms of Earth (barring a few unlucky fish 600 miles off the coast of Brazil) was minimal. But the fact that NASA "failed" to tell the world about the impact has gotten some news outlets excited. "Space agency fails to warn the world about massive blast, even though it's the largest atmospheric explosion since the Chelyabinsk meteor," writes Mirror.co.uk. But possibly the best headline comes from another UK news outlet, The Express: "FRONT-room-sized meteor came out of nowhere and exploded with force of Hiroshima bomb." Because your front room (British to US translation: living room) is now a universal standard of meteoroid measurement. Noted. The Mirror also wandered down the conspiracy path, questioning how NASA even recorded the Feb. 6 impact, highlighting Plait's analysis that the atmospheric impact was likely detected by classified military technology. Normally, atmospheric explosions are recorded by seismic monitors, microphones and/or satellite observations. As Plait pointed out, as the impact was in open ocean, it's not likely that seismic monitors would have been used to record the impact energy. As the military has pretty obvious reasons for monitoring atmospheric explosions, it seems likely the data came from a classified source, probably satellites. Though an interesting energetic event, Feb. 6 isn't the only time the Earth has been hit by space rocks since Chelyabinsk. Every single day Earth is peppered with around 100 tons of space debris. The vast majority of this mass is no bigger than a grain of sand, and on a clear night you might be lucky to see these tiny specks burn up in the high atmosphere as meteors. As they slam into the upper atmosphere, these tiny pieces of space rock create a shock wave which, through rapid heating of atmospheric gases, incinerates the debris, erupting in a fast blaze of light. These are called meteors (or "shooting stars"). Larger (and rarer) pieces of space rock will hit the atmosphere as a meteor and may explode as a bolide (as the Chelyabinsk event dramatically showcased), some pieces hitting the ground as meteorites. Monitoring the regularity of these larger impacts is key for scientists to better understand our Earth's interplanetary environment and although the Feb. 6 event is now grabbing the headlines, remember that most large impacts will happen over water (as the Earth is 70 percent ocean) and impacts of space rocks of around Chelyabinsk meteoroid dimensions are (statistically-speaking) a once in a century thing. Oh, and as for NASA not reporting a bolide impact that no one saw, well, it looks like the tabloid press has that covered. Originally published on Discovery News.